It is not as hard as it once was, to find wedding dresses for plus size women. Most wedding gown designers make sizes that go up to at least size 24. There are some that have sizes that go up to size 30. But guess what? There are designers that design specifically with the plus size shape in mind. Their dresses are designed to fit better and flatter the plus size figure. Now there is a difference in the measurements, proportions and sizing for wedding dresses made for a plus size woman. For example, a size 20 usually is proportioned differently from a size 20W. The size 20 is based off of the standard sizes from size 2 through 18. The designer grades up the sizes which starts out based on a misses body shape. The misses body measurements are more proportionate (having a very defined waistline) and is based on a B bra cup size. But a size 20W is designed to be proportionate to measurements of the plus size figure. The waist in proportion to the bust and hips will tend to be bigger than a size 20. The bust cup size is usually between a C or D cup size, which is more like what a plus size woman would wear. Also some designers who design part of their line just for those who fall into plus sizes. The styles are flattering to full figured body types and can only be ordered in plus sizes. Some designers have both their regular line of dresses that go from size 2 to 30 and also gowns that are designed exclusively for full figured women sized from 18W to 30W. The one thing that gives you a clue that a designer designs wedding dresses for plus size women is you will see plus size models in their dresses. It really helps to see a gown on a model who reflects more of your shape and proportions to get an idea of how it might look on you. Which designers are plus size wedding gown designers? The plus size wedding dress designers listed below have collections designed specifically for your shape. So you will see styles that are not only flattering but you will experience a better fit. Alfred Angelo Gorgeous bridal dresses styled with the plus size figure in mind. Their whole gown collection can be sized up to size 30W. But they also have a special collection designed just for plus size brides. Aurora D Paridisio Beautiful stylish youthful wedding gowns for plus size women that are figure flattering. Kellan J collection is part of their product line. Lots of figure flattering ruched and fitted looks to compliment you. Some with sleeves and jackets. Gowns shown on full figured models. Sizes go up to 32. Can get custom sizing and length. Allure Women They carry sleek sophisticated wedding dresses for plus women that are keeping up with the trends. There are 29 styles to choose from. Gowns shown on plus size women. All or their regular line goes from a size 2 - 32. 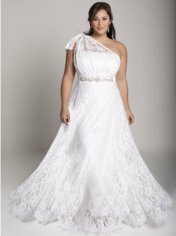 But they have a separate line in Woman's Sizes from 14W to 32W made for plus size body measurements and shape..
Bonny Unforgettable Very large collection of bridal gown styles designed just for plus size brides. They have all gown silhouettes and necklines. Gowns with sleeves and some with jackets. Shown on plus size models. Sizes range from 16W to 32W for this line. Moonlight Victorian Rose Pretty traditional a-line classic designs. Lots of side draped styles, which slim down the midsection. Gowns are shown on mannequins instead of on models. Sizes range from 14 to 28. Mori Lee Julietta If you are looking for romantic style wedding dresses with ruffles, tiers and tufts, you will find them here. There are lots on A-line classic streamline styles and necklines to choose from. Their gowns are shown on plus size models. Go up to size 28. Private Label Signature Plus Collection Beautiful bridal gowns with details that are stand out with tasteful crystal beading. Romantic and classic styles. Gowns shown on full figured models. Sizing 16W to 26W. Sincerity Plus This collection is has classic and romantic designs that featue some wedding dresses with sleeves and jackets. Venus Woman Collection Wedding dresses for plus size women that are simple and elegant, timeless designs. Shown on plus size models. All regular gown sizes go up to size 28. Venus Woman's Collection Sizes range from 22 to 28. There are more manufacturers or designers of wedding gowns for plus size women than what is listed above. In fact, most designers go up to at least size 24. But remember... the above list is of designers making wedding dresses for plus size women designed specifically for their figure types. They are cut and sized in proportion to your body. As an alterations specialist... I can say that a gown designed for a plus size woman's shape looks the best on you and has less fitting problems, which means you will spend less on the alterations. To view any of the collections above visit this online store.